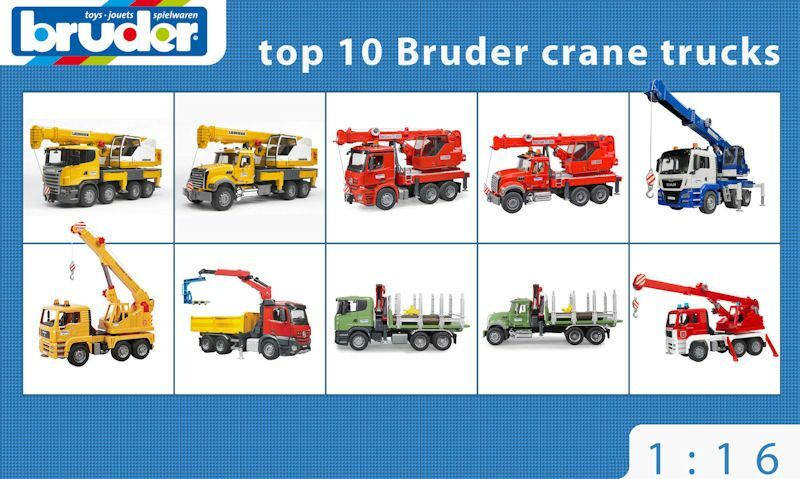 Well our focus is mostly on Bruder toy cranes for construction sites, we've also stretched our top ten to include Bruder crane trucks for fire and forestry work. These Bruder crane trucks have the ability to arrive at any site and get to work with its telescopic boom with no setup required. Simply extend the stabilizers and away you go, controlling the cable that lowers and rises with multiple attachment options. 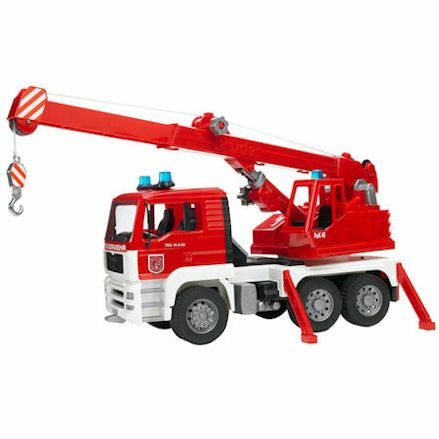 We mostly feature mobile toy cranes with their recognisable extendable boom arm, but to complete the set we have listed a couple of forestry cranes with folding crane arm, a construction open back truck and even a fire engine crane truck. 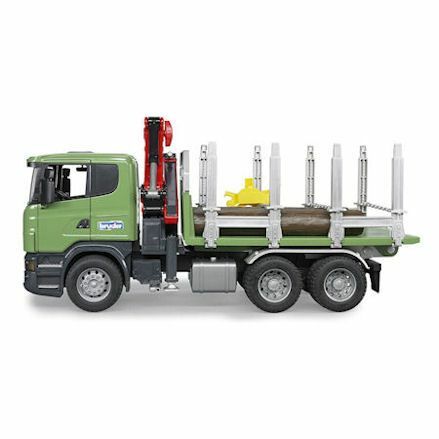 And as they are Bruder crane trucks we are talking about, you'll notice these replica 1:16 scale models are officially licensed by MAN, Scania and MACK - made in durable plastic with rubberized tires. To add extra joy to their crane play, use the Bruder light and sound module compatible with all the trucks we have featured below. 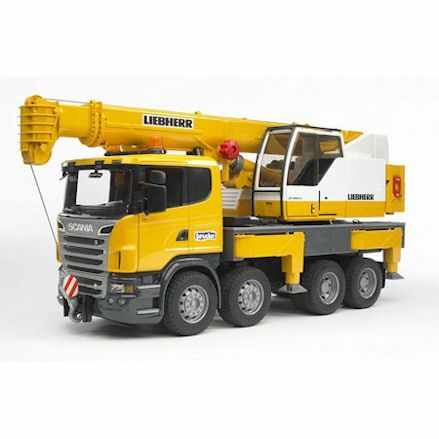 In our opinion, the best Bruder crane there is, and one that will fit any construction site in the garden, a Scania truck finished in classic Liebherr branding. Most interesting feature is the 360° turning extendable boom with adjustable knob, cable lowers and rises, stabilizers extend out and twist down to support the crane when fully extended, mirrors fold out, cabin door opens and boom control cabin door slides opens. This model tops our top ten list purely on design along, a stunning truck with the classic Scania cabin with a tonne of features and functions. This one is our second best thanks to it being a replica in terms of features as explained above, only this one is an American MACK truck, again with Liebherr labeling. Extend the boom well twisting the base 360° by hand, well using a lever to wind up and down the cable with a big hook. The big pull out stabilizers stops the truck from tipping over, has a storage container, opening cabin doors and sliding boom cab door. You have a choice between a European design featured above, or this beautiful MACK truck with an extended cabin. 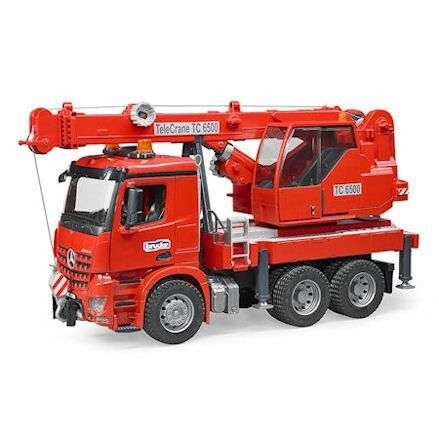 Striking red Mercedes Benz telescopic crane with multiple levers for extending the boom arm and cable well the boom turns all the way around manually. When boom is needed to be fully extended, extract the stabilizers to keep the model stable, the cab doors open, the boom control cabin door ‘slides' opens and a ladder folds down for accessing the rear platform. Flat-front driver's cabin which is regonisable in the Mercedes Benz design, which also bares the MB crest fixed to the front of the radiator. There's now an American MACK telescopic mobile crane when heavy lifting is needed on the construction site. There's up to three levers for controlling the extendable boom with cable, front doors open, boom cabin door slides to open, ladder folds down to get to control room, stabilizers pull out and the bonnet can open to view engine detail. 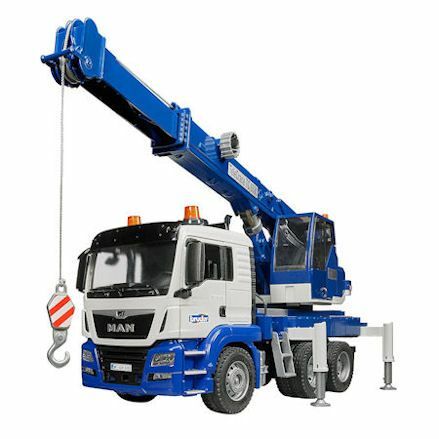 When out on the road driving the crane hook should be tied to the front to stop it swing all over the place, coursing damage to the truck and any vehicles close by. This is basically a rework of the truck featured above, with a MACK redesign. Before using the telescopic arm on this Bruder MAN truck be sure to extend all four stabilizers when operating the long crane feature. And with the use of two levers you can extend the boom not once, but twice, before applying the cable feature to hook onto heavy objects that need lifting. Additionally, there's a storage box, cab doors open and crane door slides open. Finished in grey and blue so would be ideal for the trader looking to get work at the building site, its features the MAN drivers cabin design baring the MAN/bruder logo. This Bruder (02754) MAN crane truck has been long standing in the collection, and equipped with realistic functions ever before the fancy, upgraded trucks arrived. And to this day, as last the test of time, but there are draw back compared to the latest releases. None of the doors can be opened but they are windowless so can be accessed, stabilizers are detachable, but the crane still functions using a hand lever. 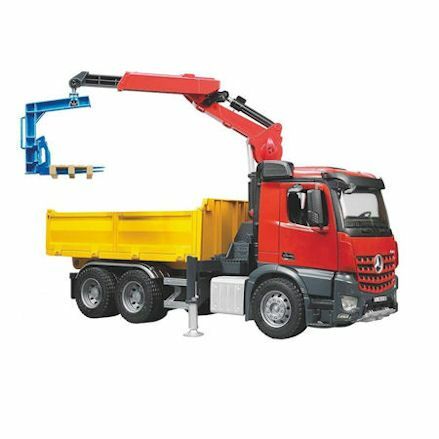 At this point on our top ten Bruder crane trucks list comes this MAN crane with obvious decrease in features, but still has the fun functions you'd expect from Bruder. This is only a crane in the forestry sense, and does not function like the cranes we listed above, the crane on this Bruder timber truck is a small grabber for loading. 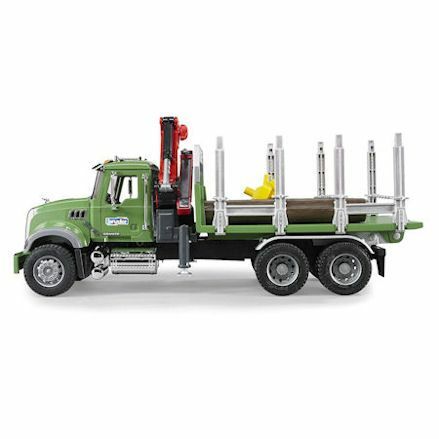 The model design also stems from the bigger crane trucks we have mentioned already, only this MACK is finished in green. Packed with features like the grabber is controlled by hand to load and offload the three logs (included). 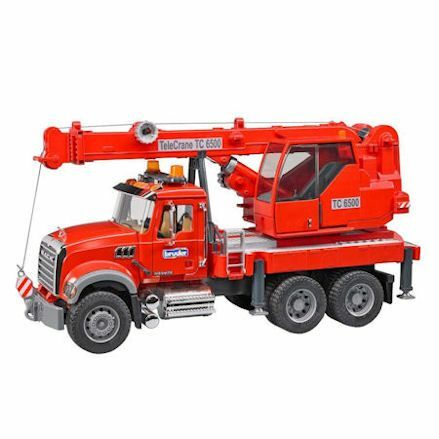 To remove and load logs, pull down the support bars and only then use the crane - but as expected - bonnet and doors open, extendable stabilizers and tipping action. If you are working on American forests then the above model is best, but for European forestry work check out this Scania timber truck with loading crane. 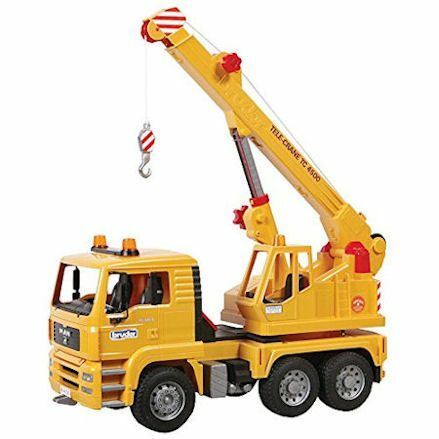 To operate the crane, unlock it and move it around by hand, then squeeze the grabber button to use the grab hold function. Then in transport mode lock the crane back behind the driver's cabin for safety. You'll need to fold down the support bars to operate the crane to make it easier, then pull up the 'metal effect' chains to support bigger loads - also as a tipping action. Well who would of thought the fire service have there own crane, well they do now with this Bruder MAN fire engine crane truck - with lights and sounds module included. This model doesn't have as many features as most, such as the doors don't open and the stabilizers are loose, so have to be fitted. But what is does have is a functioning telescopic boom with working cable and fully folding cabin for engine inspection. You're all set with all the logs needed with the truck, but you do have an option to add more logs which can be bought separately. 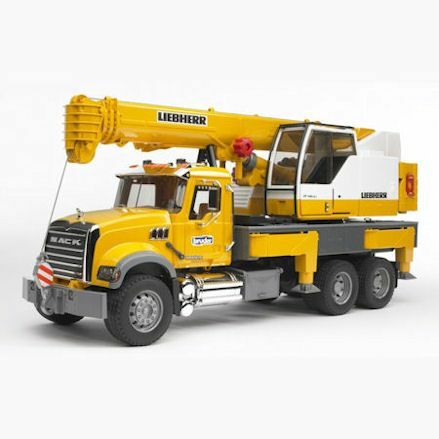 Finally, this brings us to this Mercedes Benz crane truck, for use on the construction site or for delivering supplies to customers. Like the forestry trucks above, this model has it own offloading and on loading crane with grabber, pallet and hook attachment options, depending on what your hauling. You fully control the crane by hand with a lock for securing the movement, but if you have sand, rock or mud in your container, it can be emptied using the tipping action. Other features include opening doors and four stabilizers pull out.